Sometimes, you just don’t have the time — or inclination — to create something extravagant. Fortunately, this time of year is perfect for understated cooking. The fresh produce speaks for itself. Two notes: make this salad shortly before serving (perhaps 20 minutes) and don’t refrigerate the tomatoes; doing so saps their flavor. 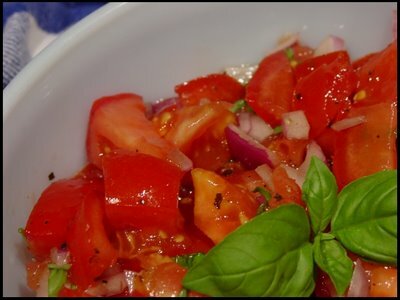 Combine the tomatoes, basil, and onions in a medium bowl, mixing to combine. Toss with just enough vinaigrette to flavor – but not overwhelm – the tomatoes. Season with salt and pepper; garnish with whole basil leaves. Serves 4-6. I make something just like this, only with a little goat cheese crumbled over. Looks delicious! Though I’m not a big goat cheese fan (I know, I’m a freak), that sounds like a wonderful idea.When I need to bring a salad or side dish to a summer picnic, I’ll frequently chop up equal amounts of tomatoes and mozzerella (e.g., 3 pounds each) and toss them with basil, balsamic vinagrette, and S&P. People are very impressed with it, especially if it’s served in a dark blue (contrasts with the reds and greens) or transparent (displays the salad’s colors) bowl. Tomato and basil are two of my favorite things about summer. I especially like it with mozzarella. That looks so fresh and delicious. There is just something about fresh tomatoes in the summer. Yum!!!! !